There’s nothing like trying to explain something to a room full of eight year olds to wake you up to the fact that sometimes, you make things way more complicated than they need to be. Last week at the Unitarian Universalist Association General Assembly I was asked to talk to a group of Youth Campers about how we “green” the event. Now I’ve watched Kindergarten Cop enough times to know that this seemingly innocent opportunity is a far more terrifying thing than it first seems. Rather than inflict them with a classroom lesson and PowerPoint them to death, we played a “Don’t Go To Waste” guessing game and took a “Super-Secret” Event Waste Detectives back-of-house tour to apply what they learned during the game. The games, lessons and information we shared were very simple, focusing on three basic learning outcomes: understanding what goes on behind the scenes to make a conference happen, identifying our event impacts and showing examples of how we can reduce impacts. In terms of impact, we talked about our event shoe size, and how different events have different “carbon shoes”. 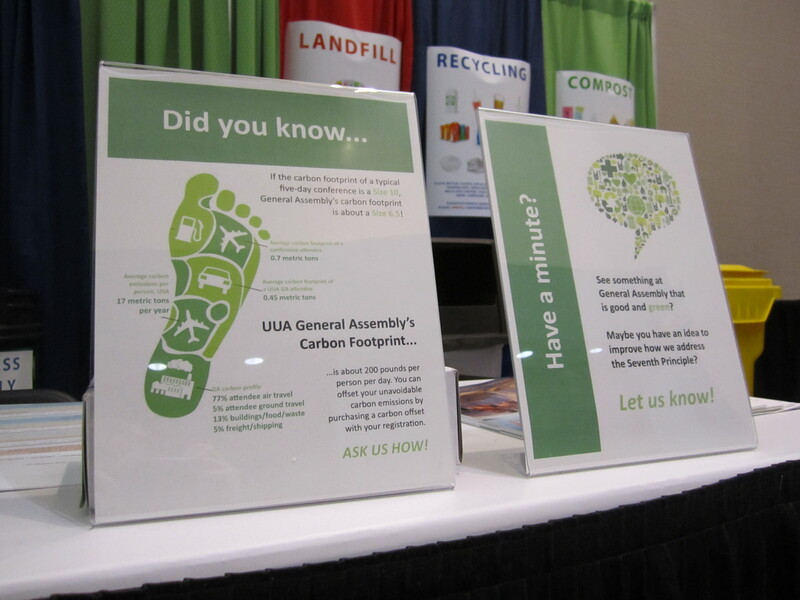 The kids learned that if the typical carbon footprint of an event is a size 10, UUA’s GA is a size 6.5. And that the size of GA’s carbon shoes increases and decreases fairly predictably every three years as the event migrates from west to east. And yes, lots of stomping around and tip-toeing on points ensued to demonstrate the impact of different shoe sizes. In terms of opportunities to shrink GA’s footprint, we talked elephants, of course. 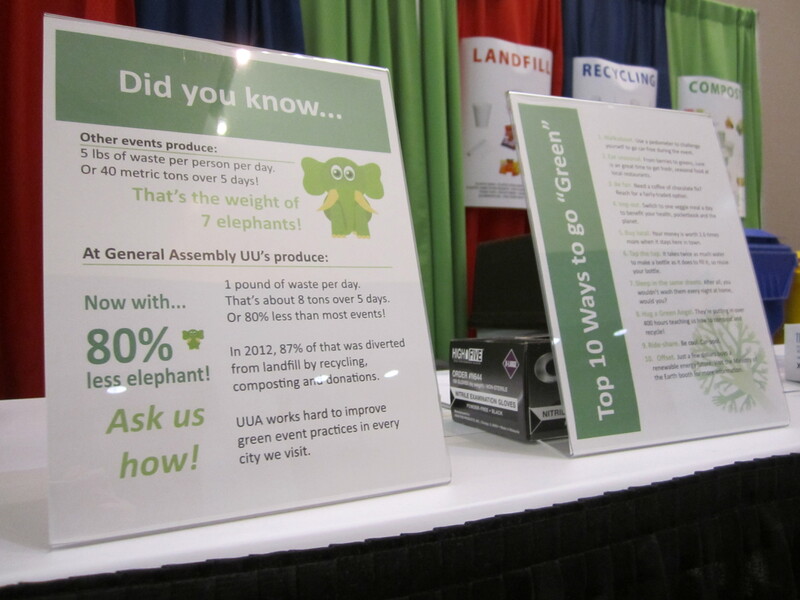 Sharing how the event’s waste footprint has been reduced from the weight of seven elephants, to less than one. And of that waste, 87% was diverted from landfill last year. 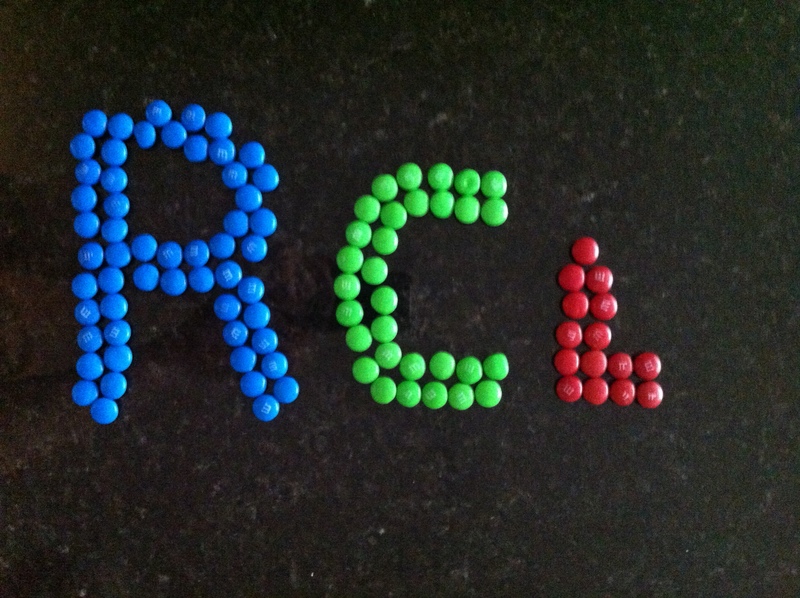 And what better way to explain event waste profiles than using bite-size candy? Much tastier than a pie chart, I think! Now all of this explaining event impacts in simple ways is not to say that measurement is easy. Giving clear, simple information like this has involved many years of tracking and comparing event impacts in ways that are objective-oriented and thoughtful. Indeed sometimes “keep it simple, stupid” requires more careful scoping and planning up-front than you might assume. 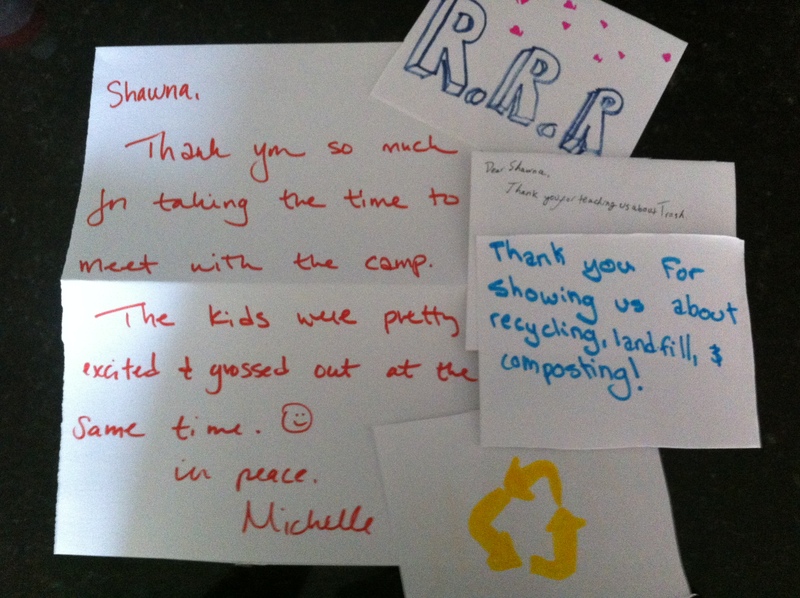 The coolest thing about UUA’s Green Event Camp for Kids? Seeing the Youth Campers come by our green booth onsite later in the week to teach their parents some of the things they learned. And give us their own ideas about how we could do better next year. The legacy? Student has become the teacher!